When a user created a meeting room and ticked of the "managed access" setting, and then entered the room, other participants were not able to join the meeting. [23.09.14 10:54:54:104 CEST] 000000b8 LogEventDAO W GWCLG0002W: User[9d08b1fbb89e7e40a929c3908545eb14] not in User table. Cant move to Usage table. --- The error occurred in com/ibm/meetingserver/logging/UserInfoDAO.xml. --- Check the parameter mapping for the 'uniqueId' property. That last line in the log regarding the "uniqueId" got me on the right track. Hmm, I can´t seem to ever have heard of a Ldap attribute with the name "uniqueId" before. So I changed this parameter to have the value "mail". 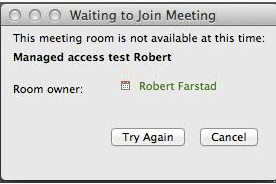 Synced the nodes and restarted the Meeting server, and now participants were able to access meeting rooms with the option "Managed Access" set (and of course where the meeting room manager was present in the room". If someone has some documentation regarding this meeting server parameter, please enlighten me about it. I have never used this parameter before, nor payed attention to it. I'm not so sure that changing that variable fixed the problem, rather the restart fixed it. I have seen something similar with a customer running 8.5.2.1 and started looking into the issue with IBM. I also found that the meeting statistics did not show the correct number of "active participants." I found no DB2 exceptions in the SystemOut.log. I tried to enable JMS trace but it wouldn't take for some reason and then the server was restarted (to apply Windoze updates) and after the restart it worked fine. have resumed it's normal operation, so things are back to normal. This would also explain why you failed to see correct statistic values for other non-managed rooms." I now changed the parameter on 3 different ST9 environments, and "managed access" started working on all 3. And I restart 2 of those environments on a nightly, scheduled basis. Fair comment. I wasn't seeing the exceptions you saw so probably different causes. 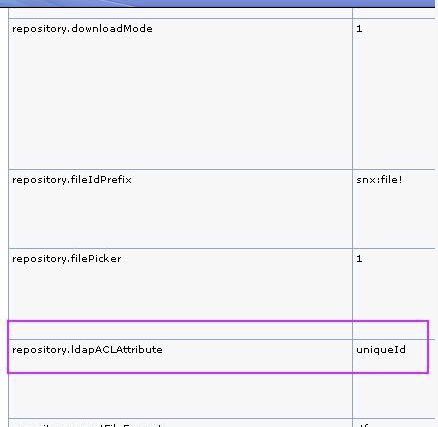 Interestingly "ldapaclattribute" is a variable defined when you integrate with Connections Files. When I integrated Sametime meetings and Connections I didn't update this value, maybe that is why it didn't work and I haven't revisited since! I have this same issue on my current ST 8.5.2 IFR1 meeting server. This setting you mention does not exist there. Any other ideas? Tim: I don´t have a 8.5.2.1 environment to compare with anymore. But what you could do in 8.5.2.1 is just add the parameter into the meeting server config. Perhaps it should be there but it´s not.